Our bowls are made of the pressed wood, which has an amazing, beautiful colour and preserves the original arrangement of tree rings. The pressed wood, similar to the oak wood, is extremly durable and resistant to damages. This gives our products a long life and prevents the impressive look for a long time. The bowl should not be washed in a dishwasher. In order to prevent a long lasting look of wood it should be wiped with a kitchen oil once in a while. Our bowls are varnished and slightly matt. 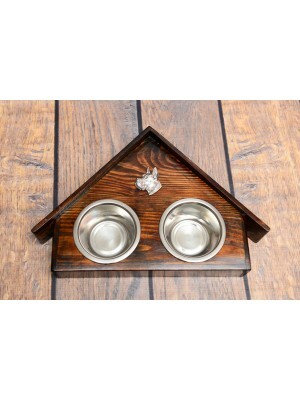 We offer three sizes of the bowl – depending on the size of Your dog. 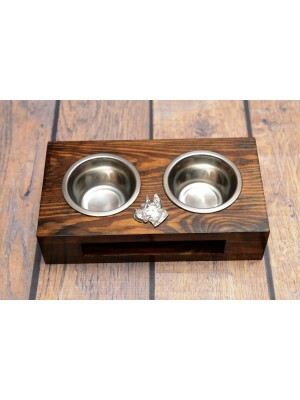 Each bowl has a silver-covered dog from our collection attached on the wood top. Each bowl is neatly hand-made with love and care for the details and easy usage.